Brain arteriovenous malformation. 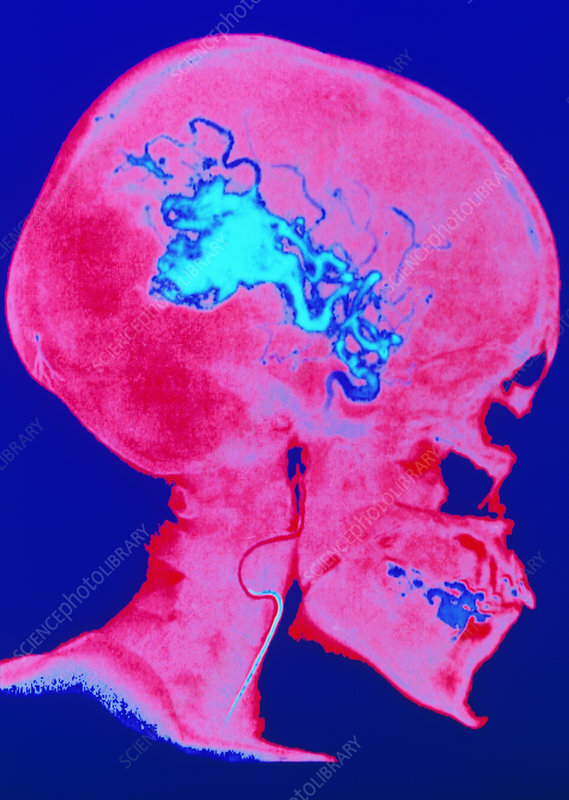 False-colour angiogram of the human head in lateral view, showing an arteriovenous malformation (AVM) in the brain. This is outlined by a radio-opaque contrast medium (light blue) and seen on X-ray. Here, the common carotid artery at the base of the neck (blue line) has a catheter & internal guide- wire advancing within it to the site of the AVM. It will deliver an embolic foam material to occlude the blood vessel malformations. This condition is also known as angioma: a knot of dis- tended blood vessels overlying and compressing the brain surface. It commonly causes epilepsy. A sub-arachnoid haemorrhage may also result.